We just absolutely LOVE these! You’ve probably seen us share them on our Instagram and Facebook. 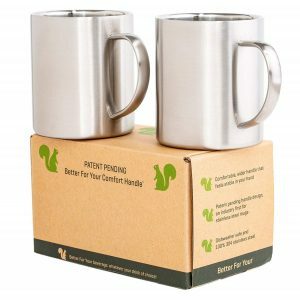 While we think ceramic mugs are cute, these double -wall stainless steel mugs rock our socks off! They keep our beverages hot or cold longer. They are unbreakable, lightweight and easy to store! Their handle is comfortable. While you’re at it, buy several. Even if you don’t live in an RV, these are game changers on how you enjoy your morning coffee or evening tea (or bourbon!). Pssssst! We love them so much that we recently blogged The Absolute Last Coffee Mug You’ll Ever Buy! Organizing your kitchen or galley just got easier. Featuring lids that snap together and snap to the bottom of the container it fits, this food storage system ensures that the right lid is always at your fingertips. Graduated sized containers nest to take up less room in your cupboard, and its square shape takes up less room in your refrigerator. For those of us who work in our RVs and still do trip planning on paper, we still need a few supplies. 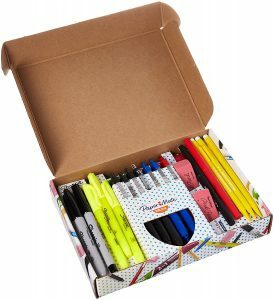 This office supply kit comes with permanent markers, dry erase marker, highlighters, ballpoint pens, gel pen, felt pens, mechanical pencils and erasers. We all have multiple USB cords, earphones, corded microphones, etc. lying around. When they’re not in use, they become tangled mess. 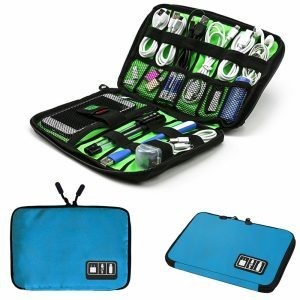 This Electronics Phone Accessories Travel Bag Organizer keeps everything all in one place. It has enough roomy to hold various items like cables, flash disk, cords, memory cards, USB drives, power chargers, small external hard-drive, adapters, pens, earbuds, etc. This electronics storage case is lightweight and spacious. Its designed to can carry everything you need when you are on the go. This organizer fits into your briefcase, luggage, backpack, tote bag or large purse. 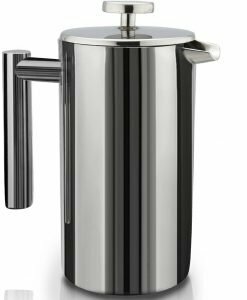 We decided this double-wall stainless steel coffee French press was perfect to include in our holiday gift suggestions list this year! Pair it with these French Press Coffee Filter Bags made exclusively for French presses! No more scooping out wet coffee grounds or wasting water to clean out the French Press! These are a hit for water-conservative boondockers too! OH! And we loved this so much that we’ve blogged about it! 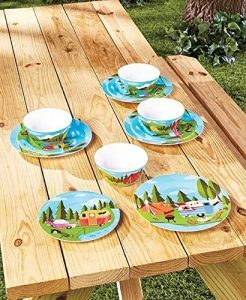 How about this adorable 12-piece melamine camper dinnerware set? Comes complete with four salad plates, four dinner plates, and four bowls. 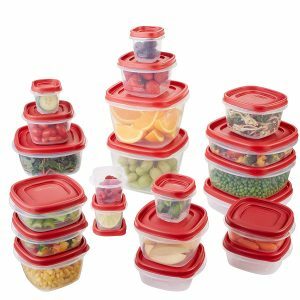 They are dishwasher safe and super lightweight which are perfect for RVs! Look at those cute motifs! Surely, a fun conversation starter! This would be a great addition to a potluck bag or cooler! Also known as a trucker atlas, this is the one paper-printed book that every big rig RV owner needs. While yes, there are mapping apps and GPS’, having an updated motor carriers’ atlas is a great fall-back in case cell or internet signals are hit or miss. it gives important information such as low clearances, weight restricted roads, etc. that every big rig RV owner needs. 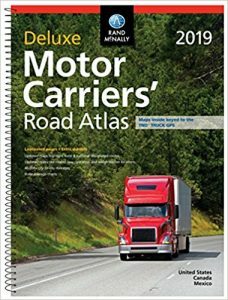 With its laminated pages and spiral binding, the Deluxe Motor Carriers’ Road Atlas can stand up to all of the wear and tear from the road. 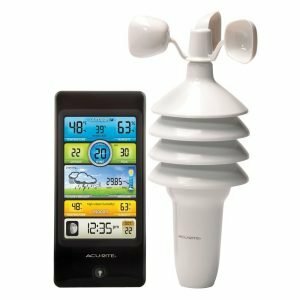 Save time and money with this easy to use atlas. 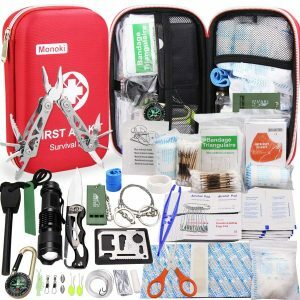 This 241-piece First Aid Kit, loaded with all-purpose highest standards FDA medical trauma supplies, is a perfect gift. This loaded First Aid Kit with bright red bag and Striking Red Cross symbol has everything you need in case of any emergency. Get one each for the car, office, second home, etc. Get one for each member of your family. This is a great travel planning resource to organize and plan your RV travel. RV Travel Planning can be tough! This is not just a pretty calendar. Its a whole RV travel organizing system! 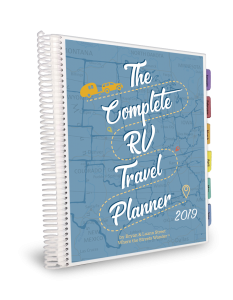 The Complete RV Travel Planner is a travel planner created by RVers specifically for RVers. The planner will help ORGANIZE, SIMPLIFY and DOCUMENT your RV travel planning by giving you space to map your routes, record your campground reservations and, daily tasks and activities. 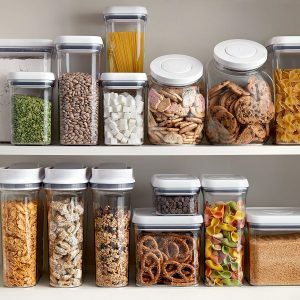 So, I mentioned the Rubbermaid food storage containers above for your leftover but how about some great organizing containers that will keep your condiments, flour, sugar, coffee, tea bags and other staples fresher longer? These airtight, space-saving storage containers keep dry foods fresh and pantry organized. Push the button for an airtight seal, push again to release. Button pops up to double as a built-in handle. Shaped for maximum space efficiency; these stackable, modular canisters can be completely customized to fit any space. 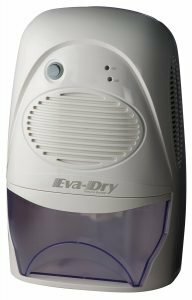 We’ve highly recommended these Eva Dry Dehumidifiers almost as long as we’ve owned our fifth wheel. We think every RV or camper owner (even boats!) should have at least one. This powerful electric mid-size dehumidifier is great for areas up to 2200 cubic feet. There’s also a smaller dehumidifier that we use in the bedroom and bathroom/shower that is totally efficient. We’ve blogged about them in our Dehumidifiers for RVs and Campers Product Review. 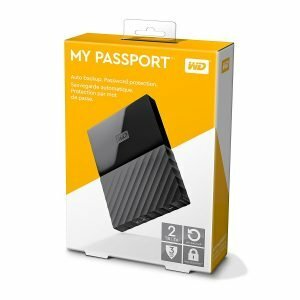 This portable external hard drive is USB 3.0 and USB 2.0 compatibility. It allows fast data transfer and will improve PC performance. It has a 2 terabyte High Capacity which provides a great storage place for all of your videos and photographs! High quality and dependable! We recommend getting a couple of these; one for your safe deposit box and one for your immediate storage. You might also want to get a protective hard drive case to store and transport it as well. We talked about these before and we absolutely love, love, LOVE our RV SnapPads! These are protective ‘shoes’ for your RV’s jack pads. They protect the surface below them as well as helps stabilize our coach on all parking surfaces. We blogged about them in our product review even! 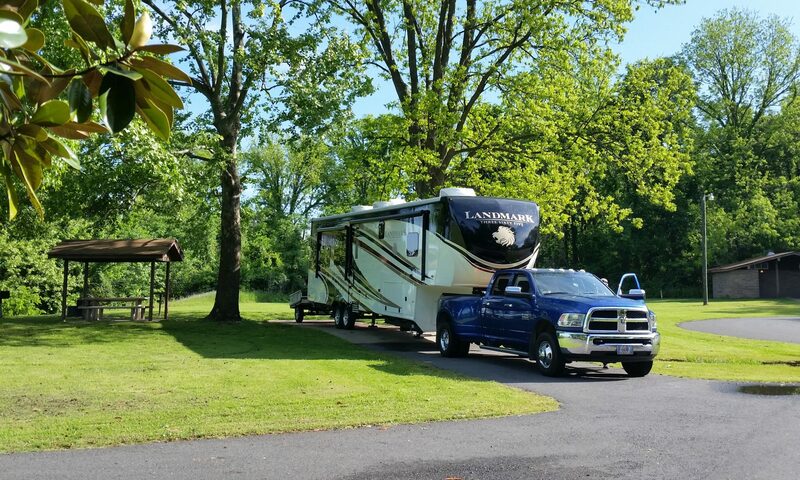 This company makes them practically for every RV out there; from travel trailer, fifth wheel and motorhome. From the garage to the workshop, from the DIYer to the professional contractor, this super kit has the tools you’ll need for a hard day’s work and the batteries to fuel them. 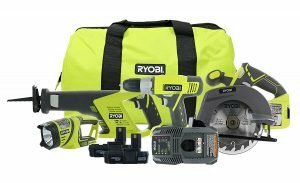 4 power tools are included here: power drill, a circular saw, reciprocating saw, and work light. Also included are two compact lithium ion batteries to power these tools as you go about your day. We recommend every full-time RV owner have these to complete a multitude of tasks on the road. 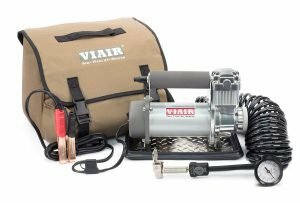 You’ll want to get a larger portable compressor kit that can inflate up to a 35 inch tire from 0 to 30 PSI in less than 5 minutes. By simply attaching its supplied heavy duty battery clamp power leads to the battery, it attaches the lever style air chuck to a tire valve stem and turns the unit on. Air pressure can be monitored using the 5-in-1 inline inflator/deflator hose and gauge included. Always turn off the unit to take an accurate pressure reading since air flow into the tire will show an inaccurate pressure reading while the compressor is running. We recommend this compressor that we’ve used on RV and truck tires. This is still a favorite of mine for RVers and Boaters alike! Our stainless steel nesting cookware set is going on five years old. All the pans have triple-clad bottoms; stainless steel, aluminum, and stainless steel. They are milled perfectly flat for even heat distribution on gas, electric, or ceramic cooktops. When you’re done cooking, the pans stack into a single nesting footprint. They are oven-safe too. 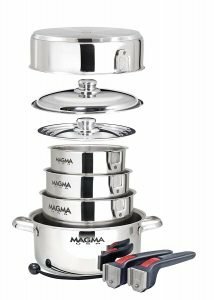 Read about them in our detailed Magma Nesting Cookware Product Review. 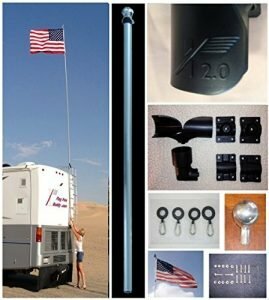 Every RVer, big or small, motorhome or towable, needs to fly Old Glory, favorite team, or party flag! We love our flag pole setup we have that attaches to our ladder when we’re parked. Its easy to install and pretty sturdy. Amazingly, its telescoping and stores to about four feet in length. 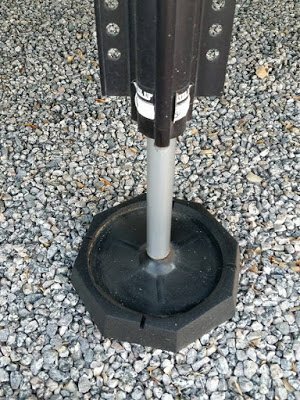 Oh, and to keep your flag lit at night, consider adding a solar powered flagpole light. Really, this IS a RV must-have to identify your RV from a couple hundred yards away. This IS the perfect scenario of you get what you pay for! 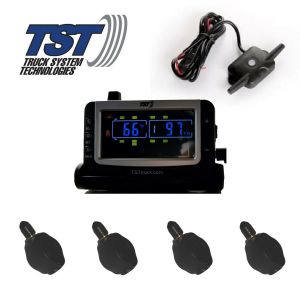 This amazing RV specific GPS is the top of the line and most popular on the road. Designed specifically for RVs and loaded with features, this RV GPS uses the award winning Rand McNally navigation system. 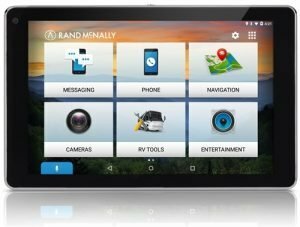 Featuring cutting edge connected technology, it combines the award-winning RV specific navigation from Rand McNally with the full functionality of an Android Tablet. Check out all of the features! So, what do you think? How about that amazing list we put together for you! We took the guess work out of your shopping! Whether you’re shopping for an RV owner or even yourself, this should make your gift recipient AND you smile! This blog is a personal blog written and edited by us. We may accept forms of cash advertising, sponsorship, or other forms of compensation. This blog abides by word of mouth marketing standards. We believe in honesty of relationship, opinion, and identity. The compensation received may influence the advertising content, topics or posts made in this blog. The owner(s) of this blog may be compensated to provide opinion on products, services, websites and various other topics. Even though the owner(s) of this blog receives compensation for our posts or advertisements, we always give our honest opinions, findings, beliefs, or experiences on those topics or products. The views and opinions expressed on this blog are purely the bloggers’ own. Any product claim, statistic, quote or other representation about a product or service should be verified with the manufacturer, provider or party in question.